Fantasy football: How the game within a game keeps fans rabidly, uncritically engaged. How the game within a game keeps fans rabidly, uncritically engaged. 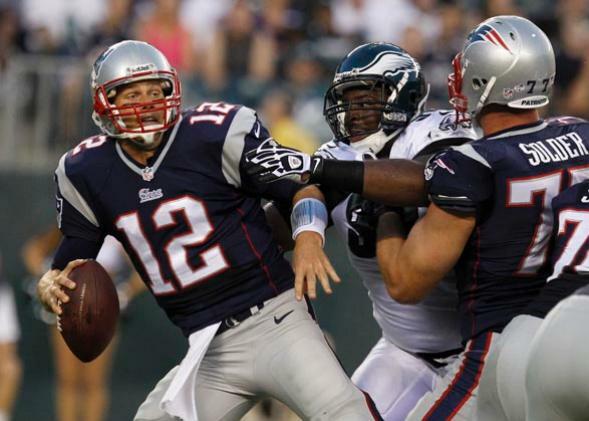 New England Patriots quarterback Tom Brady during an NFL pre-season game in Philadelphia on Aug. 9, 2013. The central operation of fantasy football is to place the facts of the NFL within the rhetoric of a new kind of game with its own logic and rules. Watching football means watching young men damage their brains. Before I joined a fantasy league, managing that whisper of conscience was enough of a struggle that I almost cut my ties to the NFL and reinvested in a less gruesome game. While it may be fair to say that players accept the possibility of brain injury in exchange for hazard pay, I still find it macabre to be part of the massive audience that makes it economically rational for world-class athletes to exchange their sanity for money. Then I started playing fantasy football, and my gridiron universe doubled in size and splendor. I’ve found myself worrying much less about the problems in the NFL—which is convenient, because the NFL’s settlement in the concussion suit would have been another hurdle for my former self to overcome—and watching more games than ever before. Fantasy football isn’t just a fun add-on to a great game. By layering a second game on top of the on-field one—what is jargonistically called gamification—fantasy adds to the cognitive blur that already makes it difficult to be critical of such a beloved national institution. The NFL certainly didn’t invent fantasy football to trick fans into supporting a ghastly enterprise: Fantasy sports existed for a long time before advances in consumer electronics made them ubiquitous, and most fantasy sites are operated by third parties unaffiliated with the NFL. It’s by good fortune, then, that the NFL has lucked into an emergent form of advertising that keeps fans rabidly, uncritically engaged. The central operation of fantasy football is to place the facts of the NFL within the rhetoric of a new kind of game with its own logic and rules. A game says: here is a goal, here are the rules that limit how you can get there—now get there. Rather than telling a player what to do, a game offers an invitation. If you accept, you go down the rabbit hole. To succeed in a game, the player must distinguish information that serves his goal from information that does not. Becoming a better player means doing more of that automatically, without thinking, before thinking. For serious fantasy players—and it is hard not to play fantasy without becoming serious about it—that means automating the process by which we ignore information that does not affect points earned. This warps the way we watch football—Frank Gore blocked so Vernon Davis could get the touchdown? What a useless idiot!—but also the way we think about the league as a broader institution. Fantasy football handles the negative externalities of a wildly successful sports business by reinserting them into another game where they do not matter. While we can’t say that the NFL has engineered fantasy to have this effect, we certainly know the league is anxious about who watches football and how. In light of the growing body of evidence suggesting that football is unsafe at any speed, the NFL has invested heavily in marketing campaigns targeted at women and children. In one campaign, football is pitched to women as a symbolic language for feminine power. In another, children build character while NFL representatives talk about how they are making the game safer with better rules and equipment. The NFL’s strategy is easy to discern. Parents are concerned about signing up their children for an activity that might cause brain damage, depression, and suicide. Get mom and dad on your side and you get the next generation of players and fans. Writing critically of the NFL’s handling of the concussion suit, the New York Times’ William C. Rhoden muses that he remains attached to the game because “football is in my blood.” Breaking that intergenerational transmission is the greatest threat to football. The NFL is spending handsomely on direct marketing—old-fashioned, expensive, blunt, and grindingly effective advertising—to make sure that won’t happen. But direct marketing asks a lot of the viewer: You have to pay attention to the commercial, figure out what it’s saying, and accept that message. It is a complex task for both the creator of the advertisement and the consumer, and one with a lot of drop off, hence the need for a huge volume of ads to create even marginal changes in consumer behavior. Fantasy football, by contrast, convinces the player to internalize premises that you could never get him to accept explicitly. Winning your fantasy league means devoting yourself to the details of football. Winning comes from luck and research, and “research” means talking about football with as many people as possible. I am clawing my way back from a Week 1 loss to Peyton Manning that even a spectacular performance from Anquan Boldin couldn’t stop, and the only way to minimize the randomness of such freak performances is to make maximally informed decisions. Like everyone in my league, I spend hours each week looking for sleepers. I know the NFL schedule for every week, including—especially—the unglamorous but all important byes. All the commercials in the world couldn’t buy that level of attention. That’s my anecdotal experience playing fantasy, and the billion-dollar industry surrounding fantasy football suggests that many others are doing the same. Some sites, like Football Guys and Fantasy Pros, specialize in fantasy. Generalist sports sites like ESPN and Bleacher Report also dedicate significant space to soaking up the bottomless appetite for start-him-or-sit-him speculation. Fans, then, are sometimes put in the position of having to choose whether to distance themselves from players (like Ben Roethlisberger) who have been accused of crimes even when they weren’t found guilty. But stepping away from a player while rooting for the team is not possible in the structure of fantasy football. My fantasy team’s best wide receiver is Brandon Marshall, whose past “troubles” include several allegations of domestic abuse. There is no way I can play fantasy seriously without starting him and wishing him the best, which puts my brain in a tricky spot when it comes to evaluating negative information about Marshall. In the context of fantasy football, the worst thing the Bears receiver can do to me is drop a sure touchdown pass. Nothing else really matters. For the NFL, the powerful narcotizing effects of gamification don’t stop there. Fantasy is also the biggest success of the entertainment industry’s current quest to figure out second-screen watching and gaming. The “second screen” is the one on the mobile device you keep checking while watching TV or playing Xbox, and every multinational conglomerate is frothing at the mouth to reclaim that portion of your attention. Fantasy football has accomplished this connection effortlessly. Look around a sports bar on Sunday afternoon and you will see people checking their phones like aliens getting a live translation of the TV’s unfamiliar Earth language. Though it would be a stretch to see all this as part of a master plan by the NFL, though it would also be misleading to think the NFL is blind to the effects of fantasy. As troubling as it is to think that fantasy’s mass following protects football from examination, its example might be even more worrisome when applied elsewhere. For all its buzzwordiness, gamification has thus far proved ineffective at getting consumers to take new actions. What it is good at, as the NFL has shown, is preventing people from paying attention to new information that might lead them to change old habits. Thanks to fantasy, it seems, pro football will be an old habit that dies hard.